The British Labour party’s new firebrand left-wing leader, Jeremy Corbyn, delighted his socialist supporters by going straight from his election win to a London pub, where he gave an impromptu rendition of “The Red Flag,” the party’s stirring anthem abandoned under Tony Blair. 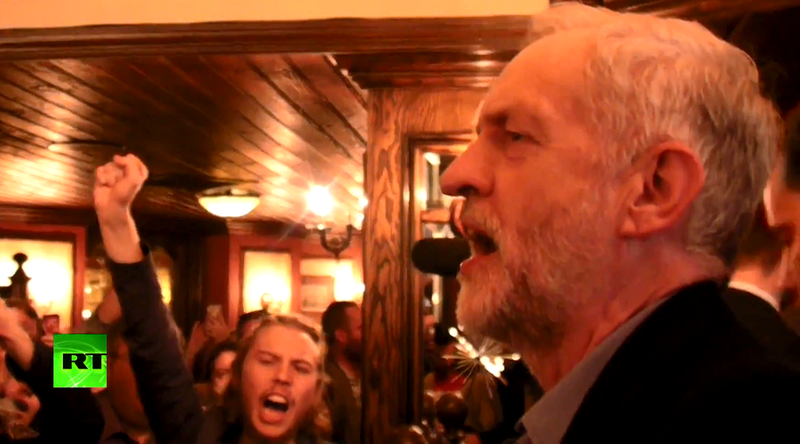 An admirer of Karl Marx and devotee of international solidarity, Corbyn, the bearded, 66-year-old MP for Islington North, led the singing of the socialist song in The Sanctuary pub. The song is one that was traditionally sung with raised fist salutes by Labour and trade union activists at party conferences and strike meetings – but was dropped by Blair, who also removed the socialist Clause 4 on public ownership from the party’s constitution. The Sanctuary, small Victorian-era pub near the Houses of Parliament was one similar to where exiled Russian revolutionaries Lenin and Trotsky held their clandestine 1902 London congress, which led to the famous split between the Bolsheviks and the Mensheviks, and the type of pub where Marx and Engels were reported to have enjoyed quaffing a pint of English ale during their years in the 19th century plotting revolution from the British capital. In a speech after the singing, Corbyn emphasized that his Labour party would be completely different from that led by Blair and other New Labour leaders. “Ours is a campaign to challenge the politics of austerity, which creates greater and greater, deeper and deeper inequality in our society. We’ve got to do something very different – and we will,” he said to raucous cheering. From the Sanctuary, Corbyn then fittingly went to deliver a speech to tens of thousands of people in Parliament Square in support of refugees fleeing wars in Syria and throughout the Middle East. The singing of ‘The Red Flag’ produced a bull-like reaction from right-wing media mogul Rupert Murdoch, who tweeted that Cameron was “lucky” to have an opponent who sang the socialist anthem. Hard left Corbyn wins in landslide, goes on TV singing "Red Flag". How did Cameron get this lucky? Hope he doesn't slack off. Murdoch, whose has enjoyed a controversially close relationship with British prime ministers from Margaret Thatcher to Tony Blair and now Cameron, has a visceral hatred of left-wing politics. There is likely to be no love lost between Corbyn’s new Labour leadership and Murdoch, as Corbyn’s newly elected deputy leader, Tom Watson MP, led a successful campaign to expose the scandal of illegal phone hacking by Murdoch’s “News of the World” tabloid.